Centara Grand Beach Resort & Villas Hua Hin, with Dr. Prachin Eamlumnow, president and CEO of Grand Prix International Co. Ltd., Tourism Authority of Thailand, Hua Hin Municipality and Prachuabkirikhan Province with support of five-star hotels in Hua Hin, will be organizing the 11th edition of the Hua Hin Automobile Concours 2013, to celebrate the 86th birthday of His Majesty King Bhumibol Adulyadej and the 81st birthday of Queen Sirikit. The event, the largest of its kind in Thailand’s history, will be held from November 29 to December 1, 2013. Revenue generated from the event will be donated to the Chaipattana Foundation after deducting expenses. Initiated by His Majesty King Bhumibol, the Chaipattana Foundation is renowned for projects dedicated to improving the quality of life and self-reliance. The aim of the rally is to raise awareness of Hua Hin as a destination for organizing unique events, and give the public a chance to view these superb classic cars. The Hua Hin Automobile Concours features a fun-filled program of activities and fine dining, most of which take place at Centara Grand Beach Resort & Villas Hua Hin. Be thrilled with the beauty of a grand parade of more than 50 hard to find classic cars. Highlighted cars include a Rolls-Royce Silver Dawn, displayed by Dr. Prachin Eamlumnow. This was an exclusive model built in England during 1949-1955. 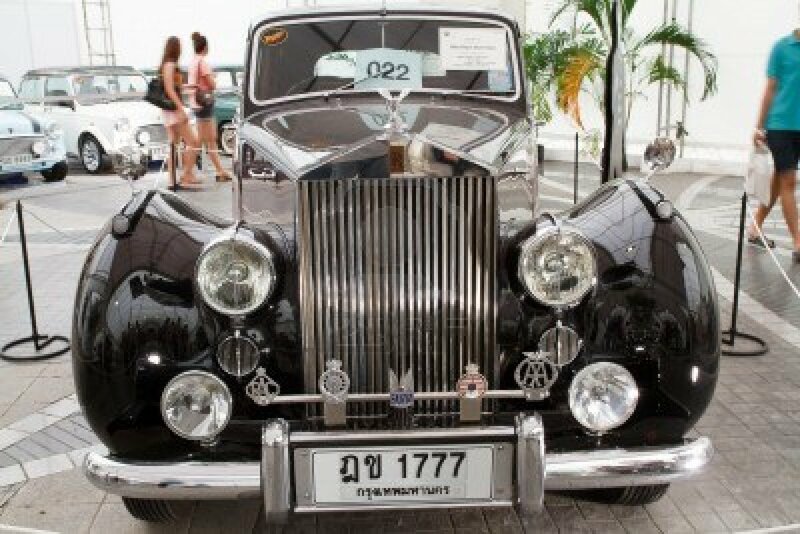 The vehicle was a birthday present for Chao Phaya Ramakob upon his return to Thailand, hence its affectionate nickname, “Ramprapath.” Queen Elizabeth II of the United Kingdom also used this majestic vehicle during her state visit to Thailand when she visited His Majesty King Bhumibol and Queen Sirikit. Another classic car at the event is a 1928 Packard 626, displayed by John Smith. The vehicle has not been shown anywhere else before. A 1964 Corvette Stingray used in the movie “Stingray” will be displayed by Syam Sethaputra along with vehicles belonging to Poj Vitjittranon, Sawad Horrungrueng and Dr. Surakiet Satienthai. There will be music and dining at the end of the first day’s event, November 29, at The Venezia and Majestic Creek Hua Hin, and a gala charity dinner that will take place at Centara Grand Beach Resort & Villas Hua Hin on Saturday, November 30, 2013. This entry was posted in Uncategorized by FBF. Bookmark the permalink.